So if you follow me on Instagram, you’ll probably have guessed that I’m currently sunning myself in Corfu, and prior to the holiday, I decided to try something that I’d been itching to try for a while; a juice cleanse. 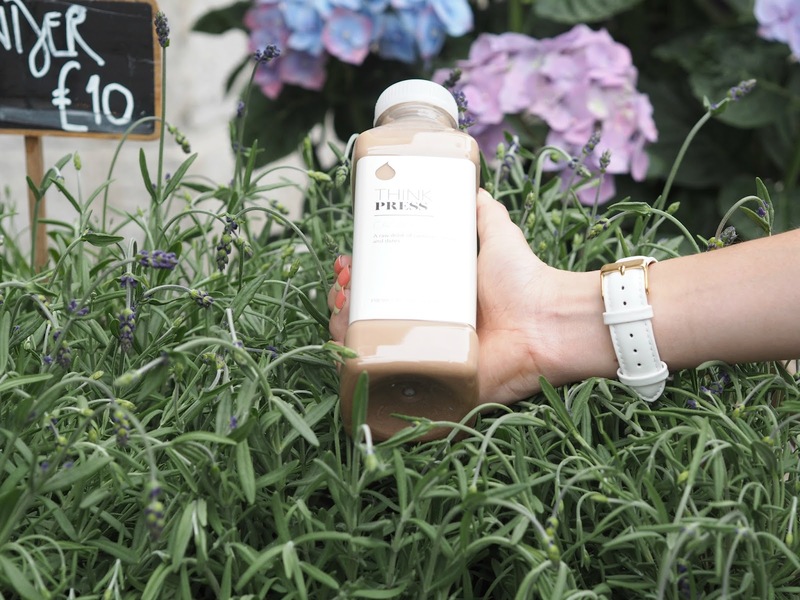 I first heard about juice cleanses about three years ago when one of the girls in the Mulberry office kept telling us about how she had so much more energy, brighter and clearer skin, and had lost weight just from drinking juices for three days. I read about how drinking the freshly squeezed or pressed juices are supposed to detoxify your body and therefore give you a healthy glow and boost your immune system, and since then I’d always been intrigued to try one. 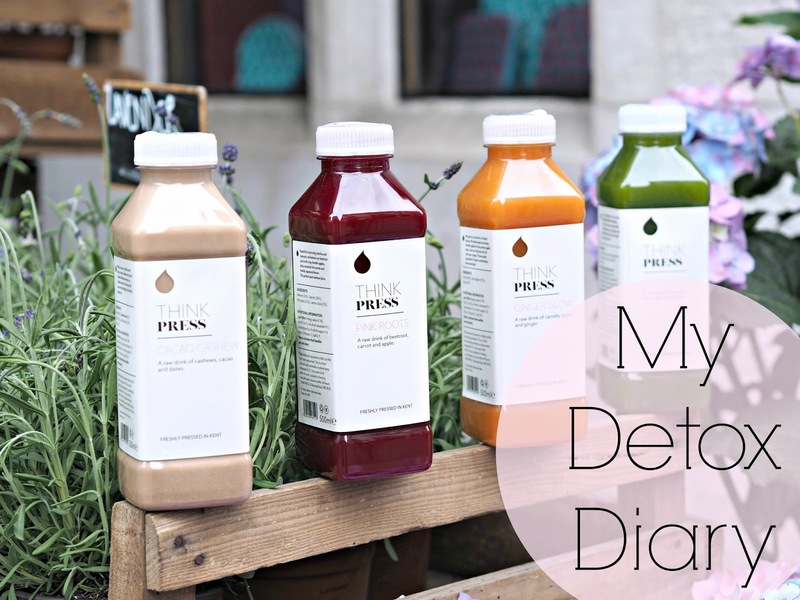 I decided to take my first delve into the world of juicing by attempting a 3-day juice cleanse from Think Press (previously The Juice Executive) who cold press fresh raw vegetables fruit and herbs for either subscriptions, or juice cleanses. The juices are pressed in the beautiful Kentish countryside, where much of the produce is grown locally. Throughout the cleanse there were certainly upas and downs, and I definitely do not have a strong sense of will power so it was incredibly hard resisting food (especially at blogger events when delicious looking canapés were being wafted under my nose!) so I decided to document my experience so that I could share it with you! I wanted to prepare my body for the cleanse, after all, going from constant snacking and a carb-heavy diet to just 6 bottled juices a day was probably going to make my body go into shock! I read that it’s best to eat a mostly vegan diet for three days before the cleanse, so I mostly ate salads, vegetable soups, brown rice and quinoa, and also some grilled chicken to fill me up (I could never be Vegan full time, I love meat too much!) I also started to wean myself off my morning Nespresso and opt for green tea instead. I started my day by waking up at 6am and doing some blog admin while slurping on a green tea, before heading to the gym for a spin class, and then into the office where the Think Press insulated box was waiting for me! My first juice was the Ginger Glow – a delicious blend of carrot, apple and ginger which gave me such a buzz that I didn’t even miss my cup of coffee! By about 2pm my energy levels were starting to crash a bit, and I felt like I needed some nutrients in my body so I reached for the Cleanse Green juice, my third juice of the day which was a raw mix of courgettes, fennel and watercress. Not quite as delicious as the Ginger Glow, but my body certainly thanked me for all the goodness. Craving something a little more substantial at 5pm, I almost reached for a chocolate digestive biscuit but with the thought of ruining it all at such an early stage, I settled for the Cacao Cashew juice next, a mix of cashews, filtered water, raw cacao, dates and sea salt. This helped to curb my cravings and the nutrients gave me the boost I needed for the rest of the day. I felt so proud of myself for not giving in to any cravings during the day, and at night I kept myself busy so as to steer away from any carry cravings. After doing some laundry, some late night blogging and watching homeland for a bit, I was ready for bed and drifted into a very deep sleep. On day 2, I actually woke up before my alarm, and had a productive morning packing for holiday and scheduling blog posts before heading off to work. Before the cravings for Cheerios could kick in, I started the day with a Pink Roots juice, a blend of beetroot, carrot, apple and lemon. I didn’t particularly stick to any timings on day 2, instead just drinking a juice as and when I felt my body needed it. The juices all tasted even more vibrant on day 2, I actually enjoyed the taste of the vegetables when previously I’d always found it a bit of a chore to drink the healthy mixtures. By about 4pm, I was seriously craving solid food. The office had been filled with foody smells and I’d perused some food blogs on my lunch break (NOT a good idea!) and it was torture!! The euphoric feelings I’d been experiencing during the cleanse fell away and I realised I was absolutely starving. Was I going to break my fast? All of this for nothing? No way. I grabbed an Ultimate Green juice, with wheatgrass, spinach, cucumber, celery, pear, parsley and lemon, and went for a brisk walk before settling back at my desk and tackling my inbox to take my mind of the hunger pangs. A blogger event in the evening was a true test, with coronation chicken cones and risotto aranchini balls being offered to me (two of my favourite things) I had to fill up on water to keep the urges at bay. I woke up early once again and not even thinking about the hunger pangs that I’d experienced the night before. My skin looked great (although I also have my Anne Semonin beauty routine to thank for that! ), my eyes looked more sparkly (I had a compliment on my eyes, from another girl, for the first time EVER! Usually they are a bit bloodshot and dry) and I felt light and lean. I was excited to grab a Pink Roots juice for breakfast, and couldn’t believe I was already on the last day of my cleanse. Just 24 hours to go and then I could eat solid food again, and better still, I’d be heading to the airport! The day went by quickly and I enjoyed all my juices, I felt so fantastic that I almost could have extended the cleanse for another 2 days (but I couldn’t, as I was heading away! ), My energy levels were high and I felt satisfied by the juices and didn’t crave food so much on the last day. I even had a juice left over, so on the following morning I sipped on that on the way to the airport since I had come to love my juice routine so much! I felt so brilliant after the cleanse that I continued to drink juices in the morning for the next week or so wherever possible, and tried to keep as close to a vegan diet as possible for the days after the cleanse. Being away made it harder, with trips to cheese producing farms and lovely tapas bars, and eventually I went back to a healthier version of my usual diet. Overall I feel cleaner, leaner and have a great sense of accomplishment, and will definitely be doing a Think Press juice cleanse again in the not too distant future. Thank you to Think Press who kindly sent me the juices to try! 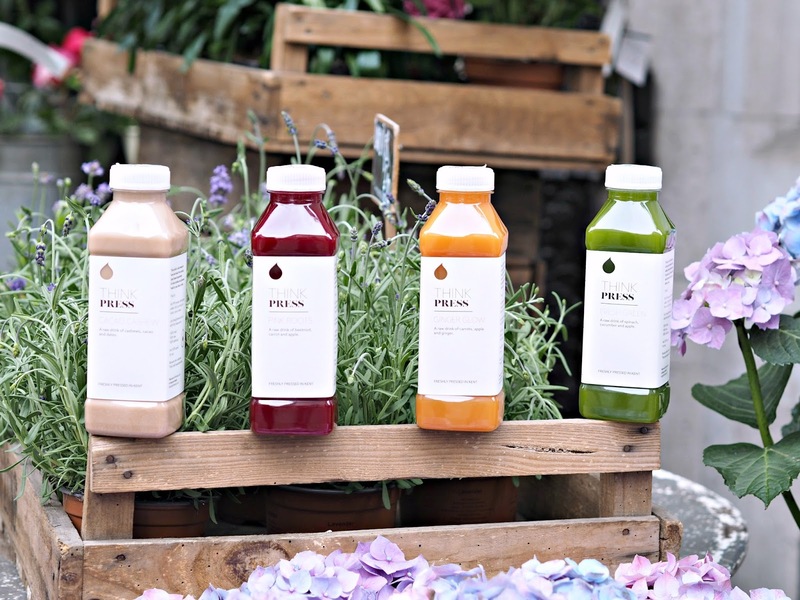 A three day bespoke juice cleanse starts at £95 inclusive of VAT. Previous Post Time to Sparkle & Swarovski Giveaway!